So it seems there was another issue with Facebook, as you will notice on your FB Newsfeed, as well as on your TV news tonight. Facebook is so BIG that if an issue happens on Facebook, its Global News. So it appears in this case that Facebook had an Audience Selector Error, that happened for a few days in May. So I’m sure you are wondering “What the HELL is the Facebook Audience Selector Error“. The following post will try to explain it as simple as possible. When you go to post on Facebook, as a norm, your posts are shared with whatever your Audience Selector is set to. For most people, that would be Friends, Family or Specific Friends/Custom (as shown below). 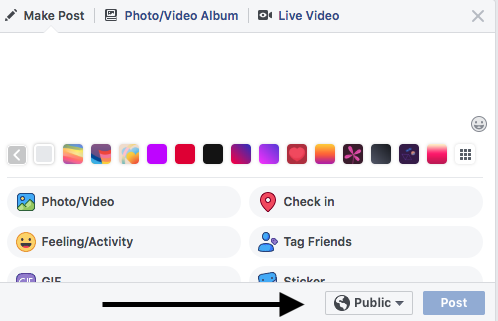 However for a few days in May, after Facebook rolled out some behind the scene changes, there was a bug created within Facebook, so that when you went to post, your default Audience Selector was set to public. If you were paying attention prior to hitting POST, you were able to change that setting back. The problem, per Facebook, is that they suspect that up to 14 million users were NOT paying attention. In essence, when Facebook compares the standard types of posts, they see that 14 million people who up to the start may of usually or always had a private / custom audience selection setting suddenly posted started posting mainly public posts. Nothing that was previously posted, was affected or changed by this bug and if you observant, you would have avoided the bug simply by manually changing the setting prior to posting. Facebook is now notifying those 14 million it suspects were affected by the bug to have them check posts they made in May. Once that is selected, on the next page, look towards the top of the page, and you will see This is what your profile looks like to: Public. Once that is set to public, you will see every post you have made that is public (as you scroll down) . If you don’t see any posts then you have not posted anything public. NOTE: You can also select View as Specific Person and see what specific people on your friends lists see. 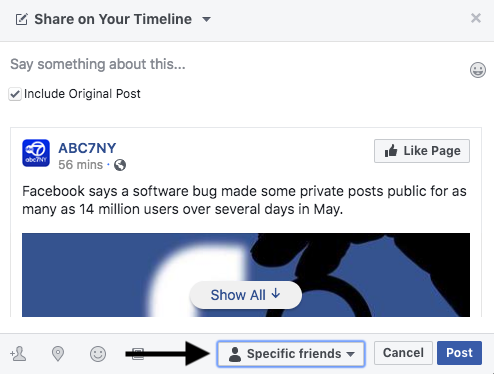 That someone at Facebook quality control didn’t check everything they were supposed to, and that caused a bug to the way Facebook operated for a few days in May.